Dr. Archer presents at the Heartland Coalition Against Gun Violence Community Forum. As I stated in an earlier blog, the death of Susan Choucroun, a friend who I met through the National Council of Jewish Women, Greater Kansas City Section (NCJW), was my final straw in gun violence and needless deaths. I belong to two organizations that helped to sponsor this event, NCJW and Grandparents Against Gun Violence. I felt that since Susan had been a member of NCJW, in fact had served with me on several committees, it was only right that I attend this event in my efforts. Listening to Dr. Rex Archer, the Director of Health for Kansas City, Missouri, Health Department, strengthened my resolve. He spoke of violence as a contagious disease that causes not only physical injury but moral injury as well. He stated that we had to stop it as we reverse an epidemic. And he stressed the new models of dealing with violence by creating new norms. He stressed also that gun violence is usually not an action by people who are diagnosed with mental illness. Instead people who are mentally ill are the least likely to do violence to others. He called it a “side-tracking issue, because without a gun you cannot do mass murder. Guns are the issue.” He continued by saying that weapons manufacturers fund the NRA. The NRA is a front for the gun industry to lobby. The audience was told that easy access to guns is the major issue, not mental health. 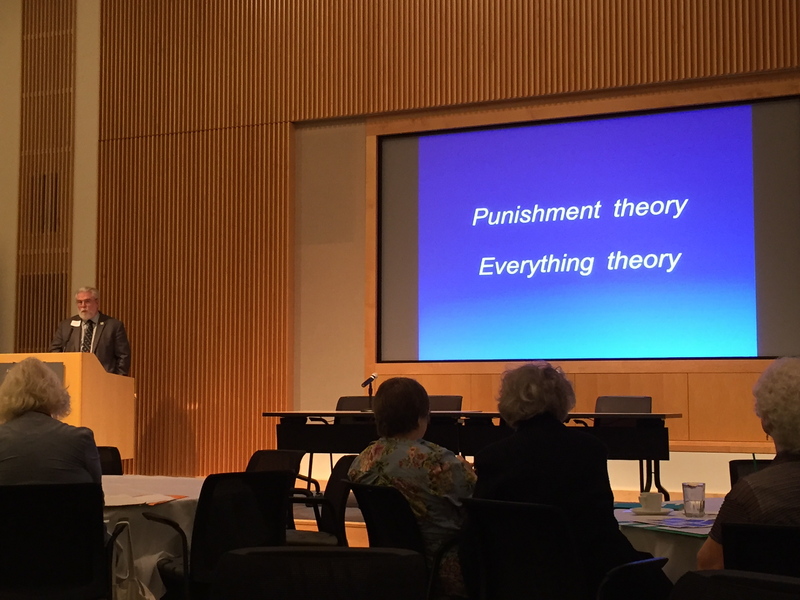 I listened to lectures by Kansas and Missouri state legislators: Barbara Bollier and Judy Morgan; by a Children’s Mercy Emergency Room physician who has seen children die as a result of gun violence; a psychiatrist; members of the Ad Hoc Group Against Crime (including Al Brooks), Aim4Peace and the Kansas City Missouri Police NoVa (No Violence Alliance). All the speakers were excellent, explaining in detail what happens to those people touched by gun violence and those who suffer mental health issues. Sixty-one percent of all gun deaths are suicide; and gun suicides account for over 90 percent of people who commit suicide. Lonnie and Sandy Phillips, parents of one of the 12 victims in the Colorado movie theater slaughter, was the most important presentation. I learned more about the PLCAA Law that was signed by George W. Bush on October 26, 2005, just ten years ago. A Law that MUST be repealed!!! The Protection of Lawful Commerce in Arms Act makes it impossible for any American citizen to sue a firearms manufacturer and dealer, or ammunitions manufacturer or dealer, for negligence when a crime has been committed. That’s right, they cannot be sued. Sandy and Lonnie Phillips tried to sue the ammunitions dealer who sent the murderer of their daughter 4,000 ROUNDS, 4000!!! Of steel sided bullets; these same bullets that were shot six times into their daughter, Jessie. Killing her! They hit her legs, her abdomen, her clavicle and one to the head that blew off 4 inches of her face. Sorry. But is it true. When they tried to sue, not for money, but to get the dealer to have to do background checks, the case was dismissed because of the PLCAA Law and they are held liable to pay for the $200,000 in attorney fees for the ammunition dealer. This is insane! The other important information I learned is about the Kansas Law that will go into effect in July 2017 that allows guns on college campuses. Oh My God!!! Do you remember last year when Johnson County Community College was on lock down? My son was there. Locked in a room with his professor and other students. Hiding in a darkened room sitting quietly but texting. My son came home after that experience stressed and saddened. I asked Barbara Bollier, a Kansas State Representative. What happens after the law goes into effect if the school security sees someone with a gun? Well there will be no lock down, and no effort to stop the person with the gun until the person fires the gun! That is right. It will be legal to carry that gun on Campus! Insanity! But it is more than that. Dr. Archer told us that 40 percent of all guns sold are sold without a background check because they are sold through internet, gun shows or personal sales. FORTY PERCENT. The background check loophole must be changed!!! I learned that we must all take action. WE must repeal PLCAA. WE must repeal Kansas Law, The Personal and Family Protection Act!!! We must vote to get the background check loophole repealed! Our Vote is our weapon against the public health issue of gun violence. We used our vote to stop smoking in public places. We used our vote to impact drunk driving. 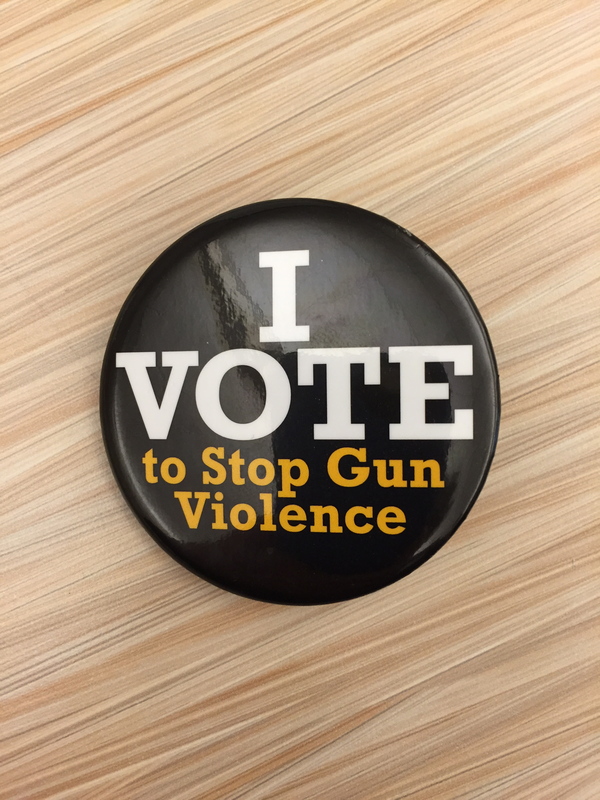 Now we must use our voices and our vote to end gun violence.